Founded on June 12, 1759 by the Moravian Brethren of Wachovia, Bethania is the oldest municipality in Forsyth County. The first planned Moravian settlement in North Carolina, Bethania is one of the few examples in the United States of a German “medieval” plan farming village. The town was laid out in this German agricultural pattern by the surveyor Christian Gottlieb Reuter. The Moravian Church owned the land. The families that lived in the farming village were each assigned equal bottom-land strip fields and upland orchard lots. Families lived on the 24 town lots that flanked a main street running north and south of a central square. The 500-acre Bethania National Historic Landmark District is the largest National Landmark in Forsyth County. Bethania and its 18th and 19th century properties are listed on the National and North Carolina State Historic Registers of Places.Bethania was re-incorporated in 1995. Today, the original village design remains visible and intact, and most town lots and roadways have remained in continuous use since 1759. Many of the historic Moravian-influenced buildings of Bethania still exist. In 2001, the Comprehensive Transportation and Land Use Study was completed for the Town of Bethania. The North Suburban Area Plan, which includes the Town of Bethania, recommends this study be used to guide land use decisions. What principles of the 2001 Legacy Plan have been incorporated in Bethania? Preserving the special character of small towns: Bethania National Historic Landmark District. Protecting historic resources: Rehabilitation of the Wolff-Moser house and Alpha Chapel and creation of draft Historic Overlay guidelines. 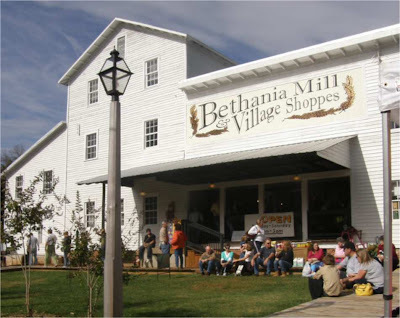 Adaptive Reuse: Conversion of an old seed mill into the Bethania Mill and Village Shoppes, the only shopping area within the city limits. Preservation and enhancement of our environmental resources: Open and forested lands surrounding the residential area of Bethania (much of this land is protected by the Piedmont Land Conservancy). Environmental awareness: Black Walnut Bottoms Loop Trail. Creating corridors for recreational opportunities, environmental protection, and enjoyment of nature: Black Walnut Bottoms Loop Trail land protected through easements. What Challenges Face the Community? Continuing the rehabilitation and preservation of existing structures, adoption of a Historic Overlay district to assure that preservation continues. Continuing the preservation of natural resources surrounding the town. Minimizing encroachment of residential and non-residential development. Finding an alternative road to reroute the heavy traffic on Main Street.